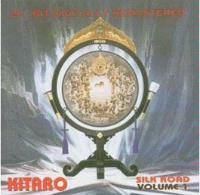 The music of Kitaro is often lumped into the new age category. Certainly that is a genre title that fits. For my money, though, it’s close enough to the music of keyboardists like Rick Wakeman to fit into progressive rock. This disc is essentially one long piece as each number segues directly into the next. It’s instrumental and provides a nice example of this artists’ work. This starts quite electronic with keyboards only holding it. Choral vocal sounds join and then it shifts towards organic Asian elements. After a time the two motifs are merged. This is built into more of a full, but still mellow, progressive rock goes new age treatment. Some spacey elements join before this segues into the next number. A gentler, more tentative element makes up the sound here. This is a far mellower piece and is fairly short. Once again it moves straight into the next one. This one comes in far more dramatic and mysterious. It’s got a bit of a Hawkwind feel a times, but I also pick up hints of John Carpenter’s horror music soundtracks. This is far more along the lines of electronic keyboard music – much less organic. It’s quite an intriguing piece and my favorite one thus far. The music turns more graceful and less dramatic as this opens. There are these siren-like sounds that are a bit jarring, though. A pretty and rather dramatic musical texture makes up the bulk of this with suitably Asian styled sounds also making their way around the track. This is perhaps more “rock” oriented than some of the other music. I’d have to say that it reminds me a lot of Alan Parsons and Pink Floyd, but with a more new age element also in play. The music here is closer to a pure new age aspect than the previous one, but this one of the more energized cuts nonetheless. A more rhythmic element starts this and the track is closer to Kraftwerk’s sounds than anything we’ve heard to this point. There is a definite electronica texture and this is quite a cool piece of music – and one that stands out nicely from the rest. It gets quite involved as it continues and lots of lines of melody are woven over the top. The music here reminds me of something from Jon and Vangelis. In fact, it is very much in that vein. This keyboard extravaganza reminds me a lot of something we might hear from Rick Wakeman. Looking at that title I can’t help but think of the Steely Dan song. This does not resemble that. Instead it’s one of the more unusual and intriguing, if a bit odd, cuts on show here. It’s very percussive based and features a lot of drumming sounds and gongs and other echoey elements. This is more experimental and ambient than the rest of the disc. This slow moving and lush piece closes things out in fine style. There are bits of space and bits of classical music in the midst.